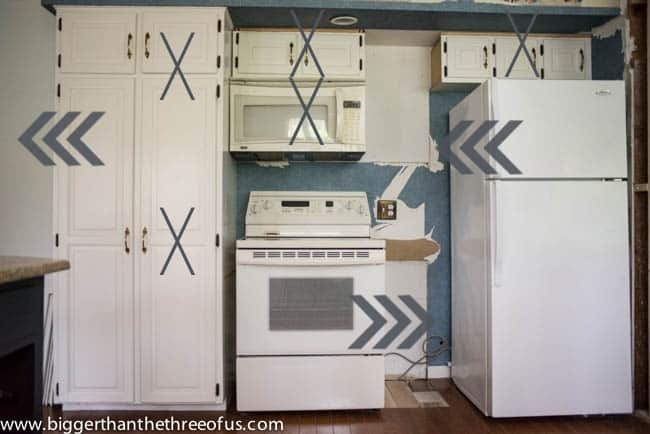 Custom DIY Kitchen Doors and Cabinets – All the Details on the Costs! I’ve been asked and asked about how we accomplished parts of the kitchen and what the costs were. Thank you for being curious! But, I feel terrible. This post, for some reason, has been slow to publish. I was actually going to publish it about two weeks ago and then we had a little mishap on placing the hardware at the wrong height. We had to sand, fill, paint and then put the hardware on again. So, all of that’s to say that I was just now able to take pictures of the whole thing with the hardware in the right spot on all of the doors. 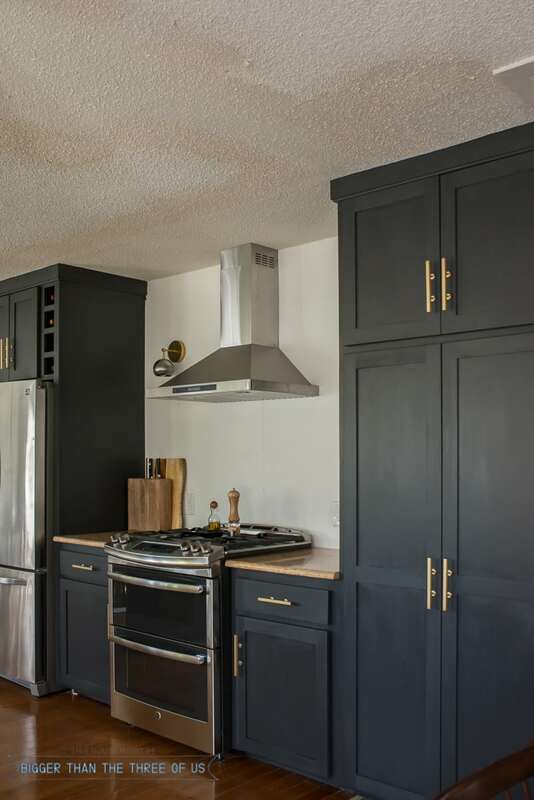 So, today I’m sharing our custom DIY Kitchen Doors and DIY cabinets – All the the Details on the costs! I guess we will talk about the original kitchen cabinets first. We KEPT all the cabinets and drawers in the ‘U’ shape. 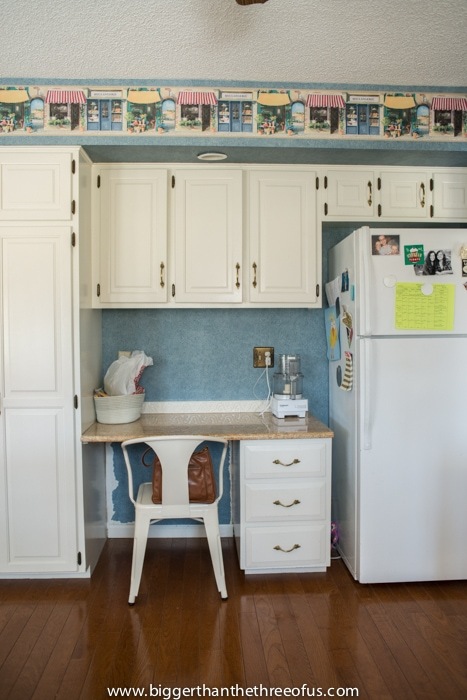 There was nothing wrong with the actual cabinets or drawers and this saved us a lot of money! The drawer fronts on all the drawers and the cabinet doors were tossed out. The drawer fronts (look closely below to see) were broken in a few spots on multiple drawers. My grandpa and I then made drawer fronts. We made them out of poplar (since we were painting them – we used Benjamin Moore Advance to paint them) and used the original drawer fronts for sizing. I believe we made 13 of them and they ended up costing around $125. They were pretty easy to make since I’m a simple girl. I wanted just a rectangle with no border or anything. *Affiliate links are provided below. Click to read my full disclosure policy. *Edited 02/23 to add: The paint color is Cracked Pepper by Behr but we had it color matched so that we could use the Benjamin Moore Advance line. 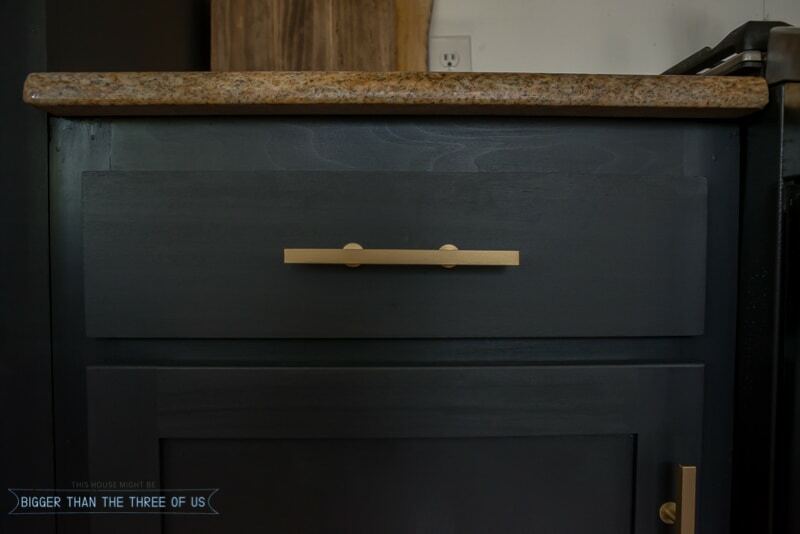 The handles are Lewis Dolin brushed bar pulls. You can find the brushed brass pulls at Lowes, My Knobs and Hardware Hut. The cabinet doors were another story. There was really nothing wrong with the cabinet doors other than I didn’t like the inset, raised panel AND the hinges were all on the outside. 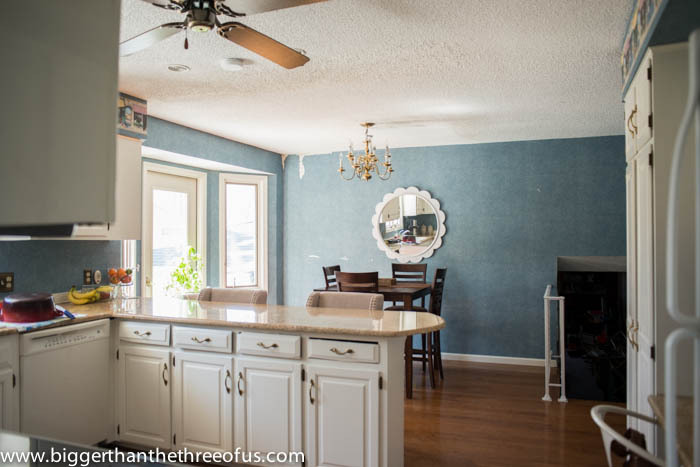 After lots and lots of looking (locally and online), we came to the realization that we weren’t going to get the look we wanted without replacing the cabinet doors. The hidden hinge hardware was not meant to be mounted on a door with a raised inside panel. We were going to try to make them work but we weren’t having much success. So, we went back and forth on whether to make the doors or have them custom made. After talking it over with my Grandpa (who helped me DIY the woodworking part of the kitchen), we decided to have them made. We ended up paying $505 for all the cabinets (including holes drilled for all the hinges and the hinges themselves)! The price ended up being just under $23 a door. When you figure in the time to drill the hinge holes and the price of the hinges, I feel like we got a steal. If you don’t know, the hidden hinges are $5.99 for two hinges. So, we would have needed 42 hinges to hang the cabinets. The hinges themselves would have come to around $130. Just to lay all the cabinet door details out – the price included the unfinished door, the hinge holes drilled and the hinges. The door price would go up if you wanted a fancier door face. I wanted the simplest thing they had and I ended up with the cheapest price because I was planning to paint them. If you wanted, say an oak cabinet door, then that would have been a little more expensive. Ok, so that get’s all the drawer fronts and cabinet fronts taken care of. Let’s chat about the wall that we completely took out in our kitchen and the cost/details of rebuilding it. 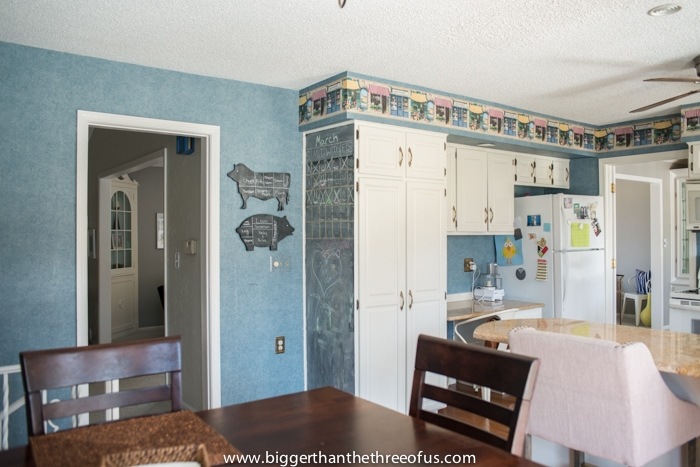 I hated the desk in the kitchen, because it was a clutter trap for us. Also, it was too low to do any kitchen prep on, so I felt like it was wasted space. We took it out and then started moving things around. We’ve already talked about the cabinet doors and drawer fronts, so let’s focus on the actual cabinets themselves. My grandpa and I built the fridge enclosure, the pantry and the two cabinets that flank the stove. I think the total cost of these units, once we finished, was around $475. There’s quite a bit of wood there and the pantry has lots of shelves. As far as a how-to on what we did, I’m not going to get into the step-by-step of that. This project was way out of Luke and I’s skill set as well as tool set. 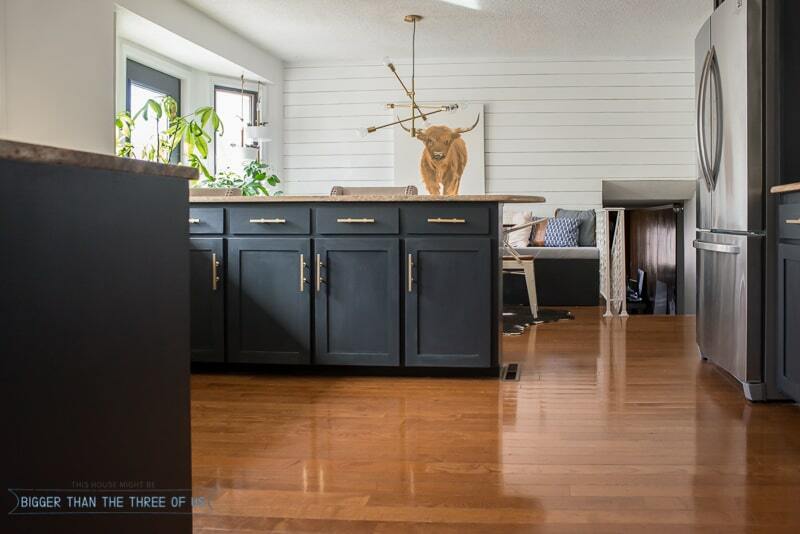 I do think we could have managed to make the cabinets that flank the stove. Also, I know there are good tutorials out there for making them, but if we would have done it ourselves… our cabinets wouldn’t have been adjustable nor would our shelves been edged with wood to make them look finished. As far as the fridge enclosure with the wine cabinet and the pantry, we would have been totally lost by ourselves. The tricks to keeping it all square (and the big pipe clamps to do this) would have been way over our head. Plus, my Grandpa decided to make up plans so that both units could be carried in the house and then tipped up, meaning the back of each unit is at an angle. Then the trim covers the angle so that you don’t see it was built that way. Anyways, the math on that part alone would have thrown us for a loop. All of that’s not to say that you can’t do this on your own. It’s to tell you that, with our building experience (the Mid-Century bed is the only thing we’ve built), it was way out of what we could do. I’ve kinda spread out the price breakdown throughout this post, so I’ll tally it all below. *Includes things like screws, nails, wood glue, etc. We feel great with what we DIY’d versus what we paid to have done. I think we spent our money really well here. Would you have done something different?